Every successful swing follows a few key guidelines. In golf, every player has a unique swing. However, there are basic fundamentals that are universal to hitting the ball well. By practicing these fundamentals, you can develop a more consistent swing and become a more consistent golfer. Before you swing the club back, you need to be set up for success. Stand with your feet shoulder width apart and square to the target line. Grip the club and bend from the waist. Your weight should be equally distributed and your arms should be relaxed. When you have a proper setup it's much easier to make a proper swing. A proper takeaway is important to starting the swing on the right track. Many golfers start the swing by whipping the club back with their hands. This motion leaves the rest of the body behind and throws off a golfer's timing. Start your swing by turning your shoulders back and keeping the clubface square. To check this, keep the grip of the club pointing at your belly button for the initial two feet of the swing. 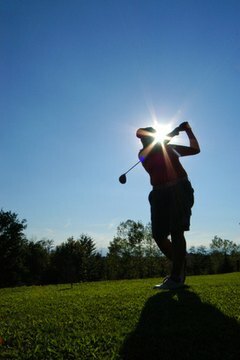 Many golfers allow their hips to sway during the golf swing, rather than rotate. This causes all kinds of trouble and leads to a variety of mis-hits. Focus on your right hip and make sure it does not move laterally during the backswing. If you can rotate your hips without the right hip moving sideways, you will start to develop a more consistent swing. After hitting the ball, you want to make sure to swing through to a full finish. In a good finish position, you should have all your weight on your front foot and your chest should face the target. To develop good balance, try swinging to this position and holding the finish for three seconds.